Over an eight-year period, Surviving Home documents the story of U.S. Military Veterans from four different generations. They all face challenges, triumphs, and post-war difficulties while each finding their own particular way of continuing to help others. I had the privilege of speaking with Bobby Henline, a 4-tour Irqai War Veteran, Retired Staff Sergeant and Wounded Warrior. 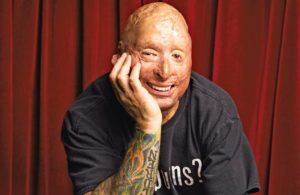 On his fourth tour, an IED blast blew up Henline’s Humvee. Of the five men in the vehicle, he was the only survivor. 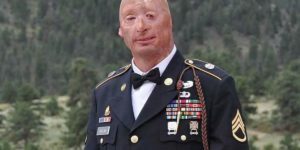 Burns covered almost 40 percent of his body, bones in his face and shoulders were fractured, and his head was burned to the skull. He spent the next six months fight for his life. To date, he’s had over 40 surgeries. This is his story. I cannot thank Bobby enough for the time he spent speaking with The GM’s Perspective. The documentary focuses on your life after the war. Over an eight year period, you were one of four military veterans who were followed through your journey back home while trying overcome challenges that no one could even imagine. The GM’s Perspective: Your wife said that each time you came back you were different. From an outsiders point of view, can people really understand the entire process of deployment and returning home? Bobby Henline: I don’t think we understand it at that point when its happening. We’re excited to be home, but at the same time there’s so many questions to be asked to make sure we’re OK. They try to check on us, but we know what to answer to get us home quicker. When we get home that’s when things unfold and you wonder what’s happening. You can’t make a decision and we’re just numb. The best movie that showed that so far was American Sniper. Not the stuff he did out on the range, but when he got home and the transformation. GMs: The topic of you reentering the army in 2001 because of 9/11 was heart wrenching. Your wife wasn’t familiar with the lifestyle and you even said you were gambling with your life every day. BH: When you look back, you have to see where you came from to understand where you are today. I knew in my heart something was wrong. I really didn’t think I was coming back from that tour. But I knew I had to do my job no matter what. This is what I love doing and I’m supposed to be there for my brothers and sisters. I went in knowing or thinking I was sacrificing myself at that point. When I came out of it, my mindset was why I am here/I don’t understand? It took me a little over a year to figure out that I can still serve. BH: Yeah, looking back at even just the recovery time and what I’m doing today…Having so many people saying I’m helping them, it helps push me forward. Every time those negative thoughts creep in my mind, there’s always someone that reaches out on social media and says they’ve been following me for a few years or they tell me their story and they share with me how I’ve helped them. That gets me through every time. I call that God’s little winks. God winks at you and lets you know that you’re on the right path. We have to give ourselves those time outs to express whatever it is we’re feeling and let it out. GMs: One part that really stuck out was you talking about seeing your kids/grandkids everyday and it makes you realize that you can give back. BH: That’s why I don’t want to confuse people that think I just wake up everyday and think life is great. This has been a great year. I’ve been busy at work and had my second grandchild with a third on the way! I have a roof over my head, food on the table, and my family. It’s the little things we take for granted everyday and I do the same thing. Sometimes I get caught up asking myself if I’m doing the right things, am I making a difference? I beat myself over that, but I remind myself of all the good things I have in my life. GMs: What has the comedian inside you meant for your recovery and growth? BH: I’ve always been that person who uses humour to get through stuff. It’s almost like I’m a different person on stage, but it’s me. It’s a different side of me that I can share. You can’t be one sided through life, you must look at it through other people’s eyes. When I get up there and there’s energy going back and forth and the crowd’s laughing, that’s the best feeling ever. You’re helping them and you’re helping yourself. GMs: During the film you said “Addison Hope, adding hope!” I love that. You’ve went through family, personal and professional struggles, things I will never fully comprehend. What do you want “Surviving Home” to signify? BH: Surviving Home is about different generations and we were all treated differently. I think the connection the film has between the veterans and the civilian community is that we are all in this together. We can still make a difference and we’re still functional. Don’t write us off. This film shows that these guys have been through the worst and can come back and be a part of society.